Generally a cake will not come fresh out of the oven perfectly flat and level. Even if you have used baking strips (for more information about these, see my Secrets of the Cake Decorating Pros e-book) there will still be some kind of dome on the top of your cake. You will notice that no professional looking cake will ever have a dome on top so here is a guide for how to level your cake. It will take a lot of practice but don’t be afraid to give it a shot and soon you will be an expert! Step 1: Locate where the cake needs to be cut to achieve the best flat base. It will probably be just at the point where the dome begins or if your cake is not overly tall, you may wish to remove less of the dome and start 1-2 cm from where the dome begins. This cake below is one that I have made using baking strips and has only a slight dome shape but is still not flat enough for my fancy cake! Step 2: Use a sharp long serrated bread knife and place a mark where you will begin cutting off the dome. Once you have removed most of it, you can then ‘shave’ off little bits to get it to an even level. Make sure you keep all your off-cuts. Don’t be tempted to eat them!! Step 4: Use a spirit level to check your level. One like this can be purchased cheaply from a hardware store. (This step is optional – if you trust your eye, go with it!!) It doesn’t need to be 100% perfectly level at this point, just close enough that the main top points are pretty flat. Rotate your spirit level to all different points on the cake to check it is pretty even all round, not just in one direction. Step 5: Flip your cake upside down. If you are travelling with your cake or it is going to be stacked, glue it down to the cake board with some icing. Buttercream or royal icing will make sure the cake doesn’t slip or move off the board in transit. A small amount of approximately 1 tablespoon will suffice and make sure it is not visible coming out from underneath the cake. 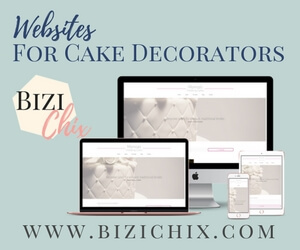 Note: if you are placing the cake on a fondant covered cake board, I would suggest you firstly place the cake on a thin cardboard or disposable cake board so you can decorate the cake without dirtying the decorative cake board. It can be placed on the final cake board right at the end (also with some ‘glue’ to secure it). In my sample cake below, I have just placed the cake on the MDF board as is, so it doesn’t matter if it gets dirty – I can wipe it clean at the end of the process. Step 6: As you can see in my cake below, I have a big gap around the edges as I was trying to save a massive amount of the dome from being cut off. Why waste cake when you don’t need to?! Step 7: This is where you can fill in the gaps around the edges with the excess cake you have cut off. Depending on the cake you have made (eg. light buttercake vs sticky mud cake), it may be easier to use big chunks or little crumbly pieces. Simply “stuff” the cake around the edges taking care not to raise the cake or make it unlevel. Try to keep the spirit level on top of the cake so you can watch that you aren’t filling one side more than another. Why do this step? Having an even smooth edge of the cake will make it easier to ice the cake especially if using fondant. If there was a big gap along the bottom, it would probably result in your fondant caving in around the bottom of the cake, which would be noticeable to the eye once decorated. Another reason is so that your guests are not served a piece of cake that has more icing than cake or a big chunk of air between the cake and the icing! Step 8: Keep working all around the cake filling in the gaps. Step 9: Clean off any messy crumbs and really make sure you have pushed all the cake in firmly. Keep your eye on the level of the cake all this time but this is where you can fix any issues with your ‘not so perfect’ cutting job… Check that the stuffed cake is not jutting out from the edge of the cake. Run your finger around it to remove any bits that may be sticking out further than the edge of the cake and push in any loose bits. Now you are ready to ice your cake! Just a few years ago, I had never baked a cake from scratch and now I am known as the Cake Decorating Queen. I’m not a professional. I just love caking as a hobby – and I’m proud of that!